Canola is a very important crop and there are a lot of management factors to be taken into account to make a success of canola. 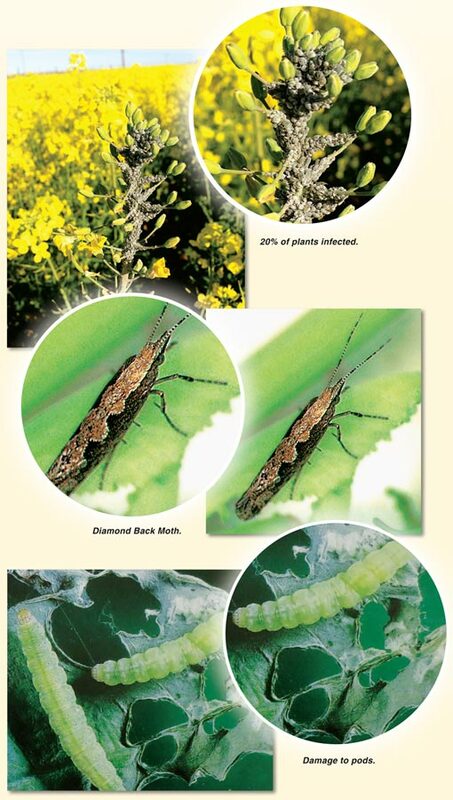 Insects like the Cabbage aphid and Diamond Back moth can still do harm to canola and have an influence on yield. The cabbage aphid is currently the primary species that feeds on canola. Canola is extremely sensitive to aphid infestation during the early growth stages. Heavy infestation during the flowering and podding stages may prevent flower formation and seriously impair the setting and filling of pods. This has a big influence on yield. If moisture stress occurs it is important to protect canola from aphids. Threshold values: 20% of plants infected. This is an insect that is underestimated and the damage that is done is more than we think. Depending on the ambient temperature, the adult insect (the moth) is usually noticed at the stem elongation phase. The light green larva eats holes into the leaves. Pods are also attacked, but the damage is usually superficial and pods are seldom penetrated, however damaged pods tend to shatter more easily. There are more than one generation per season. Threshold values: Middle to late flowering: 17 to 23 larvae per 10 plants. Pod filling: 43 to 57 larvae per 10 plants. Sampling is very important to detect this insect early and to control it. When the temperature is high the Diamond Back Moth tends to multiply very quickly. Consistent (regular) inspections are very important to control these insects to minimise the effect on yield. When canola is established, it is important for all seeds to be sown in moist soil to ensure uniform germination. If this is not done, germination may occur unevenly, which will in turn cause uneven ripening and complicate the harvesting process. Many farmers ask: “Should I harvest directly or rather swath?” The availability of equipment will also play a big part in the decision. Why swath (mow down first)? Swathing may enable the producer to harvest 8 to 10 days earlier, as seed ripen uniformly. Swathing is important where fields ripen unevenly. The ideal time for swathing is when the seed have changed colour between 40% - 70% and have a moisture content of 30% - 40%. However it is better to start cutting canola at 50% seed discoloration rather than 40%, in order to eliminate the risk of starting too early. In hotter, dryer areas, it is better to swath canola when seed discoloration is 50% - 60%, because higher temperatures cause windrows to dry faster. Consequently the seed does not develop fully into maturity, which causes green kernels (high chlorophyll content). To determine the seed discoloration, samples of 100 pods should be collected from the entire field. Seed ripening starts at the bottom of the plant and pods should be picked from the main stem at the bottom, middle and top of the plant. Seed that changes from green to yellow, brown or black must be counted. Discoloration speeds up when it is hot and dry, and slows when it is cool and moist. When canola is swathed, the cutting height must be above the branching of the plants, so that the standing stubble forms a fork, in which the windrow can lie. Cutting height is very important and the ideal height is 35 cm to 45 cm. Canola can be harvested approximately 10 to 14 days after swathing. When canola is harvested the practice for rapeseed should be followed. The drum and wind speed speeds are set at approximately half to two-thirds of the speed required for wheat. When canola is threshed after swathing, the picker should be set as far horizontally as possible to ensure the least possible windrow disruption. Try to keep the picker speed and ground speed of the combine harvester at the same level. As canola is easily threshed from the pods, the concave should best be set three to four settings wider than with cereals. When canola is directly harvested, leave the green parts for later. Chemical ripening is an alternative to swathing, especially where the crop has lodged or where weeds have germinated late. It is important to spray at the correct time. The ideal time is 80% to 90% discoloration. The canola will be ready for harvest four to five days following spraying. As can be seen when harvesting canola, everything has to be done on the right time and inspections to find the right time is very important. 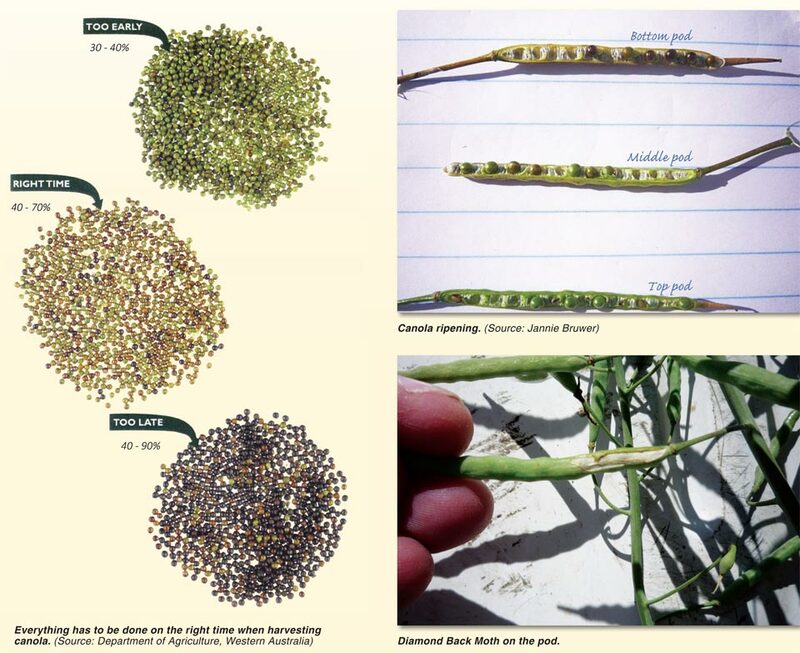 Article submitted by Jannie Bruwer, Area Manager: Southern Cape, Bayer Crop Science. For more information, send an email to jannie.bruwer@bayer.com.